I’m very excited that I released a zine this week. It’s called Thatcher in the Rye (the pun is from @JonathanDean_) and tells a story about a hike I took on imitation of Theresa May’s fateful trip to Wales in 2017. 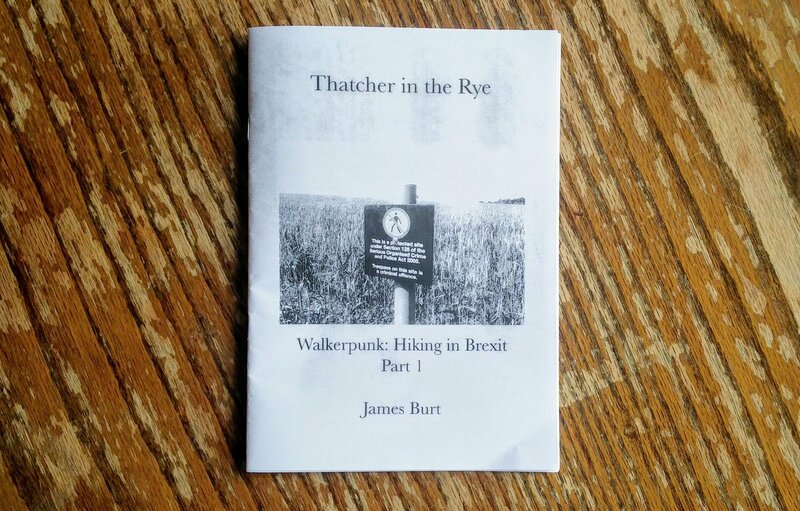 I’ve been thinking about hiking and Brexit for a while, and this is the first of a series of pamphlets on the subject. The first edition is just 23 copies, but I might do another run if people are interested. I’m currently working on a second instalment, which will be about Daniel Hannan, and a walk Chris Parkinson and I took in Hampshire – a walk that turned out far stranger than expected. I’m terrible at actually getting things into the world, so this is a great achievement. I have too many finished projects that have only been read by one or two people. The zine is not perfect – the images are pretty much illegible, but that can be fixed in the second edition. I’m also not sure what people are going to make of the content, which deals with contentious issues, taking a view different to a lot of people I know. But I think it is good getting projects into the wild. Committing to releasing something changes the course of the work. And there is a significant amount of work to be done after getting a clean draft of the text. This is only a small thing, but positive step.